Recent housing news has been positive: US homebuilder confidence rose 1 point to 63 in April, according to the National Association of Home Builders. Sentiment levels have held in the low 60s for the past three months, any reading over 50 is considered positive. Also, mortgage applications to purchase a new home increased 1 percent last week and were 7 percent higher than a year ago. However, total mortgage application volume decreased 3.5 percent last week from the previous week, according to Bloomberg. Strong earnings sent investors into risk assets and the yields on Treasury bonds back up to levels last seen before the March Federal Open Market Committee meeting. The benchmark 10-year UST jumped 9 basis points to yield 2.59 percent, and the 30-year UST finished 8 basis points higher to 2.99 percent. Tax-exempt yields were little changed. The 10-year MMD was 2 basis points higher to 1.94 percent, while the 30-year MMD was unchanged at 2.69 percent. Source: Thomson Reuters, Bloomberg. 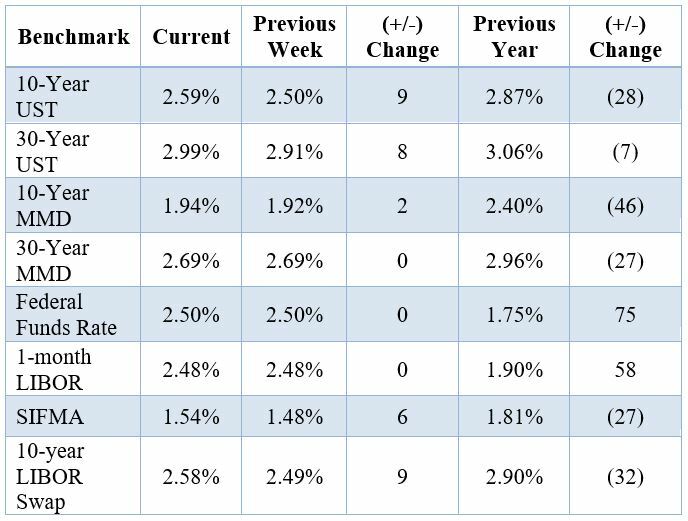 The table above reflects market conditions as of April 16, 2019. This material was prepared by Stifel, Nicolaus & Company, Incorporated (“Stifel”). This material is for informational purposes only and is not an offer or solicitation to purchase or sell any security or instrument or to participate in any trading strategy discussed herein. The information contained is taken from sources believed to be reliable, but is not guaranteed by Stifel as to accuracy or completeness. Past performance is not necessarily a guide to future performance. Stifel does not provide accounting; tax or legal advice and clients are advised to consult with their accounting, tax or legal advisors prior to making any investment decision.